To maintain the virtual machine later on, you will need to log on to the machine via SSH. Authentication is handled by a key pair – if you have ever worked with SSH, you will be familiar with the principle. To generate the key pair, click on the green link Create new key pair and enter a name, such as test . Create and Download generates the key pair and offers to download the private key in the test.pem file in this example. Eucalyptus keeps the public key. In the Key name drop-down box, select the previously assigned key name (test, in this example). It may take some time for the matching entry to appear. Launch instance(s) now finally lets you start the virtual machine. However, the virtual machine takes a little while to get on its feet and appear in the list (Figure 10). Clicking on the (green) cryptic names in the Instance column displays a register with more information. The Public IP column tells you the IP address on which the virtual machine can be reached using SSH, and the Private IP column is used for communication between the virtual machines. Figure 10: A virtual machine (instance) running. where test.pem stands for the file containing the private key, and the address 192.168.100.100 is the Public IP of the virtual machine (Figure 11). The user ec2-user already exists in the mini CentOS system; otherwise, the root username should do the trick. Figure 11: After successfully logging into the virtual machine. To stop the virtual machine in the web interface, uncheck the little box in the first column and then select the desired action below More actions , which is Terminate in this case. The default user account is only suitable for your first steps. To delete it and set up other users who can start virtual machines with their own accounts, you need to access the Admin Console. It can be reached on https://<frontend-computer>:8448 . Again, you need to add the certificate as an exception. Log in with the eucalyptus account, a username of admin , and a password of admin . A wizard prompts you to enter an email address and change the password for security reasons; then, you can manage your user accounts under Accounts . 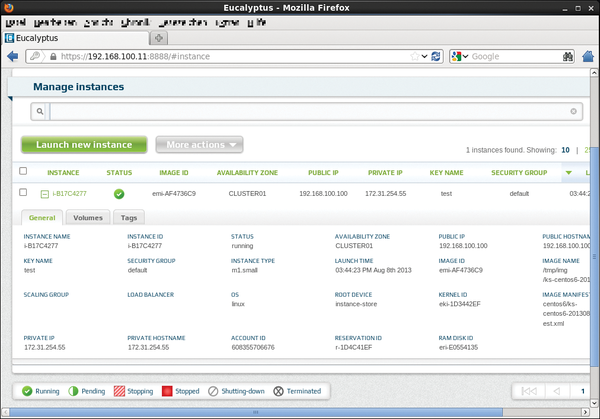 For more details of using the two web interfaces, check out the Eucalyptus Console User Guide . If you want to store your own operating system images in the cloud, you will need to study the extremely comprehensive Administration Guide. These guides also explain how to assign the virtual machines to security groups, create Amazon-style availability groups, and provide cloud storage space.